More Than Words was a huge hit in the early ’90s, and learning how to play it will really-really improve your fingerpicking technique and coordination. It is quite a complex song, with manychords and alterations to the chords, so don’t expect to be playing it perfectly on your first go. 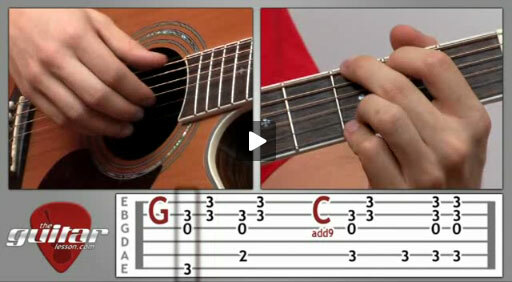 To be able to play More Than Words, you’ll need to learn to finger picking patterns that repeat throughout the entire song. Once you have those programmed into your picking hand, you can move on and learn the chords and progressions. And there are quite a few, so make sure you have your tabs in front of you when you practice the song after watching the video lesson. This song would be quite difficult for novice guitarists who haven’t yet develop finger coordination and have just started out with our beginner guitar lessons, but choosing to practice this song will really advance your guitar skills. The benefits of learning a song like More Than Words are tremendous. You will vastly improve the coordination of both your fretting and picking hands, and play a wonderful song in the meanwhile. A win-win situation 🙂 If you are an absolute beginner, you might want to check out some of our easy guitar songs before tackling this one. Important: The original version of this song is played with all strings tuned down 1 semitone from standard tuning, so your tuning would be: Eb Ab Db Gb Bb Eb (standard 1/2 step down). In the video lesson, I teach the song at standard tuning for simplicities sake, which sounds good if you are just playing along by yourself. BUT! If you want to play along with the backing track or the original song, you will need to tune down all strings by 1 semitone, otherwise you will sound out of tune. More Than Words was recorded by Extreme, and released on the second album, Extreme II: Pornograffiti in 1990, and as a single in 1991. The song is a rock ballad by genre, and is built around intricate acoustic guitar work by Nuno Bettencourt. MoreThan Words is a love song, where the person to whom it is addressed to show love through "more than words”, hence the title. Sorry, but you've reached a premium content area. The download of the More Than Words tablature file is only available to premium members. Sorry, the same goes for the backing track. To download the backing track to More Than Words, please log in and revisit this page.